A pivotal presidential contest in the thick of the Civil War, the election was hotly contested in Pittsburgh. Note the role of the ‘Wide Awakes,’ the Insurgent Youth of the time. Cartoon of Abe Lincoln and Gen. George McClellan prior to 1864 election. 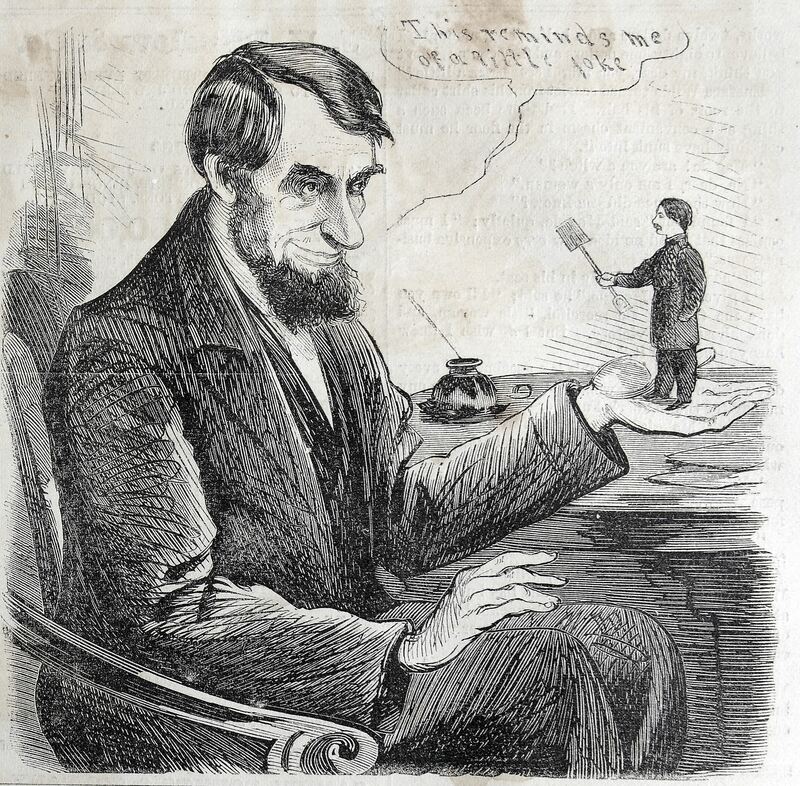 Illustration in Harper’s Weekly, June 25, 1864. Nov 2, 2014 – While the editors at Pittsburgh’s Gazette and Post disagreed on almost every issue, the rival newspapers were united on one topic: the importance of the presidential election of 1864. “The main issue … is no less than the preservation of our country and with it the preservation of our liberties,” The Daily Pittsburgh Post opined. Despite worrisome results in congressional elections a month earlier that showed Republican gains, Democrats in southwestern Pennsylvania were counting on a win in the presidential contest. The Post was the city’s pre-eminent Democratic newspaper, and its editor, James P. Barr expressed confidence. Six days before the election “the Democracy of Washington, Beaver and Allegheny counties, with their wives, children and sweethearts, turned out en masse to vindicate the Union and the Constitution,” the Post reported Nov. 4. The mass meeting was held in Clinton, Findlay Township. Why 35 horses and riders? The Union, until the admission of Nevada on Oct. 31, 1864, had 35 states. Union Gen. George McClellan had agreed to run as the Democratic Party candidate against Abraham Lincoln. Lincoln, a Republican, and his vice-presidential running mate, Andrew Johnson, a Democratic senator from secessionist Tennessee, ran as National Union Party candidates. If Lincoln had persuaded a Democrat to run with him, Pittsburgh’s Democracy — as the party referred to itself — had found a former Republican to back McClellan. “The last grand rally of the Democracy of Lawrenceville will be held on Saturday evening next, at the corner of Butler and Allen streets,” the Post reported Nov. 4. Speakers would include Thomas Little, described as “the facetious captain of the 1860 Lincoln Ox Roast … and a former leader of the Lawrenceville Wide-Awakes.” It had taken him four years, but Little was “now thoroughly awakened” to the dangers posed by Lincoln and the Republicans, the newspaper said. The “Wide-Awakes” were young men’s political clubs organized to support the Republican Party. Carrying oil lamps or torches in nighttime parades, members had provided security at campaign rallies and carried out some quasi-military drilling. Lincoln was counting on votes from soldiers as one of the keys to his re-election, but the Post ran several stories suggesting he would have trouble on that front. “The vote of the Army is for Little Mac,” the newspaper reported Nov. 3, reprinting a letter that had appeared in the New York World. Pittsburgh Republicans seemed appeared unfazed by Democratic attacks. The next-day results, however, were not looking good for McClellan. “Abolitionists appear to have increased their majority by a few hundred since the last election. The aggregate vote is astonishingly large … which can be accounted for in no way except by illegal voting,” the Post said. Lincoln and Johnson had racked up a 55 percent to 45 percent victory in the nationwide popular vote and an overwhelming win in the electoral college. McClellan carried only Delaware, Kentucky and New Jersey. Again rolls up her thousands ten. Says Yankee doodle, doodle doo. Len Barcousky: lbarcousky@post-gazette.com or 412-263-1159.